UN - Eighteen trucks transporting 700 metric tons of food – enough to feed 45,000 people for one month – have arrived in South Sudan via Sudan today marking the opening of a humanitarian corridor that is hoped to enable delivery of much needed assistance to the embattled nation, the UN World Food Programme (WFP) reported. “Reopening this humanitarian corridor from Sudan will help reduce our heavy reliance on costly air operations to provide assistance in conflict affected areas of South Sudan,” WFP South Sudan Country Director Joyce Luma said today. Airdrops and airlifts are critical in sustaining food assistance to remote areas but cost six to seven times more than delivery by barge or road. Today’s delivery crossed into South Sudan from Kosti, a Sudanese city on the western bank of the White Nile River. 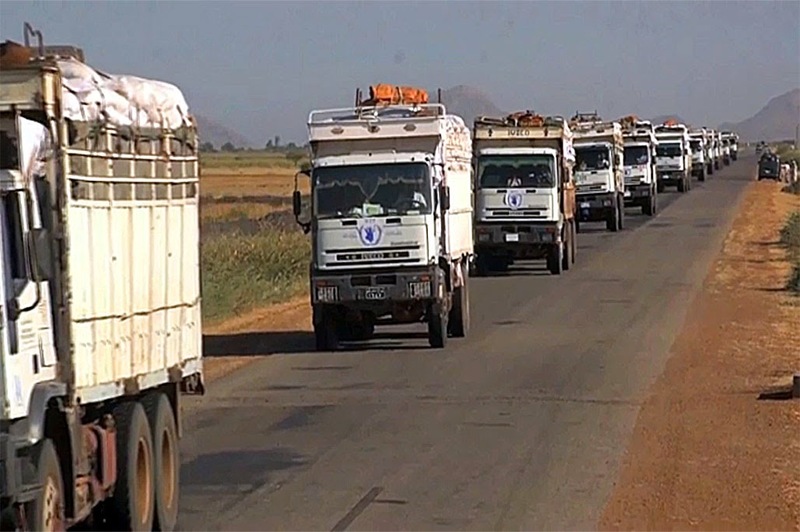 The new cross-border operation will see WFP use trucks and river barges to deliver a total of 4,650 metric tons of food to feed around 275,000 people for one month in the northern parts of South Sudan who have been affected by the conflict. “This will allow WFP and partners to reach more vulnerable people with the urgent food assistance that they need,” Ms. Luma said. Since the start of the crisis in South Sudan in December 2013, WFP has reached 2.5 million people with lifesaving food and nutrition assistance.